Ever met someone in business who comes across as arrogant? My executive clients say if they sense a person is arrogant, it’s an instant deal-killer. So, what’s the distinction between arrogance and confidence? We all have blind spots. In research on first impressions, it’s clear that people make “blink” decisions about you within seconds of your first meeting. Is it possible to unintentionally give the wrong impression? It happens all the time. One big factor is your non-verbal communications. 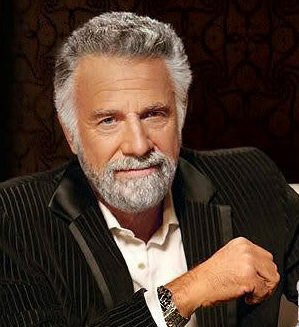 For example, “The Most Interesting Man In The World” pictured here has a facial expression that shows a sense of moral superiority. Scientists call this expression “contempt,” and it’s one of the few expressions that is not symmetrical, so it’s easily recognized. Probably, the actor is not even aware he’s making this face. He’s just pretending to be this “bigger than life” character and the expression naturally comes out. That may be great in a funny commercial, but not in a real business situation. What can you learn from this? Before you enter your next meeting set your intention to listen, learn and find a way to help others. I know that sounds like “Kumbaya”, but it’s a simple way to get your non-verbal signals to naturally align with your intention. Without formal training, this will help you be perceived as confident vs. arrogant. . . which is a good thing, unless you’re Donald Trump and make your living by being known for arrogance.